SimplyFun believes that play is essential for developing skills that go beyond traditional learning. They design games that help children develop strategy, decision making, and creativity. 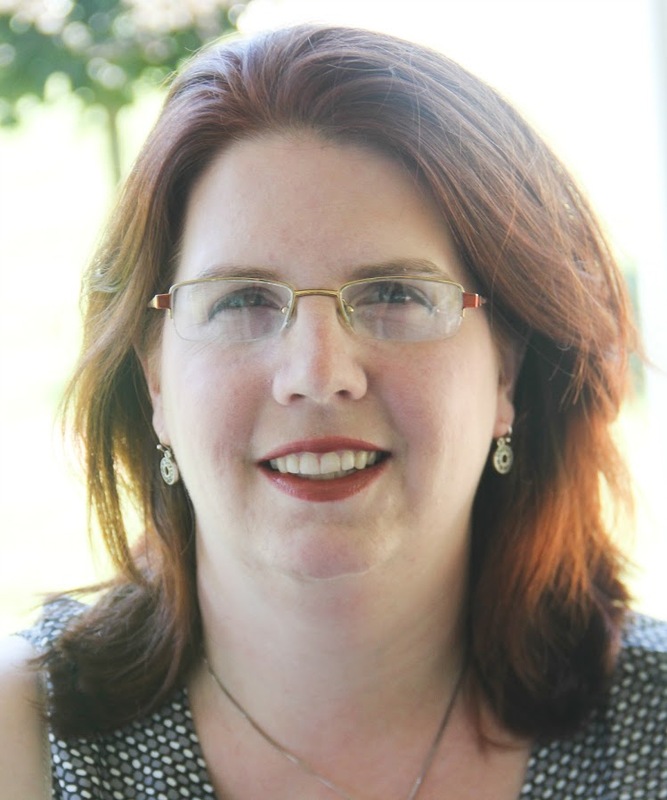 This company so firmly believes in the power of learning through play that they have created a Play Advisory Council to help identify key skills for development via games. They have over 200 games for players of all ages - from preschool to adult. 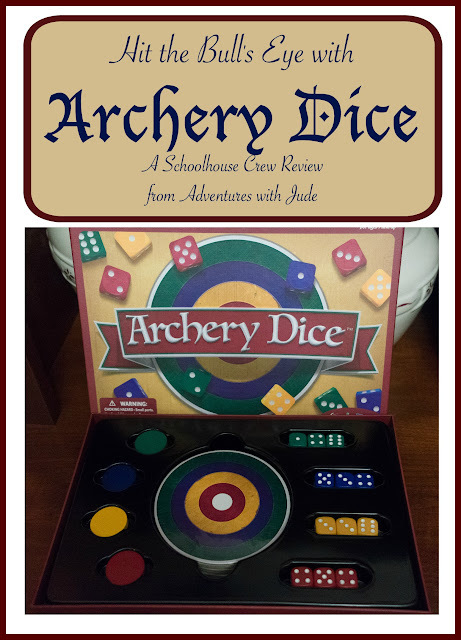 We were happy to be reviewing Archery Dice, one of four of SimplyFun new releases. 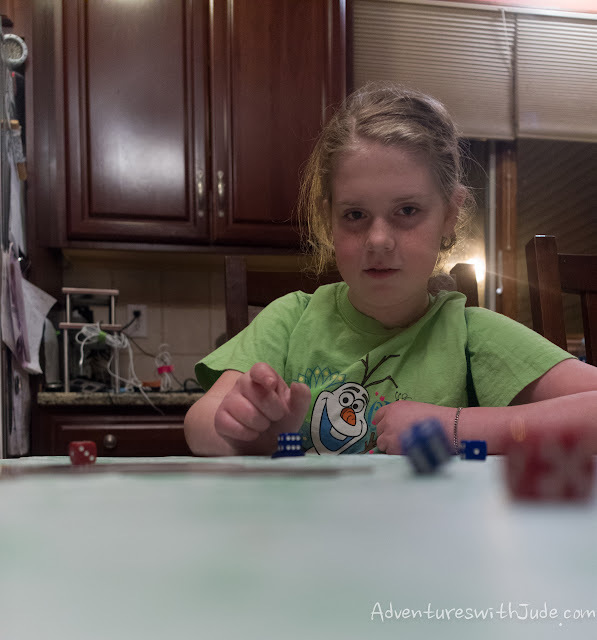 Archery Dice is a game of strategy and fine motor skill practice for children (and adults!) 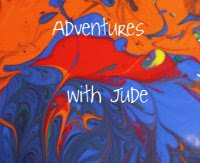 ages 7 and up. Like it's namesake sport, the goal of the game is to earn points for hitting targets. It seems like this should be pretty simple. The basic premise is reminiscent of marbles. The "board" is set by putting (three bulls-eye) targets in the center of the table. Each player (supplies for up to four players are included) stacks three dice about 12 inches from the targets. Then, each player takes a turn and "flicks" the top one into the center, hoping it lands on one of the targets. Sounds easy, right? Except it doesn't really go that easily. "Winning" is not just about getting your die into the center. The first question is "Which way to flick?" Not only can you flick towards the center targets, but also towards your opponents! If you successfully take out your neighbor's tower, the defeated party loses a turn. It's a risky move...if you hit, it keeps others from playing, but you risk missing and losing your chance at points. While there are rules about what to do if your die bumps somebody else's off the target, or how to tally scores, the hardest part is having the fine control to not only send your die where you want it, but to keep it from going where you want it. When we first set this game up, everyone was excited. It seemed like it would be easy and fun. Until dice started flying, and the "the-rules-say-so" consequences. If your die goes off the table, you lose a turn. There were a LOT of lost turns when we played. At first there were giggles as dice went zinging by, but then frustration set in. Not only was nobody winning, but we were all getting tired of chasing dice around the room. Moving from the table to the floor didn't improve the situation. It gave a wider field of play...but also more furniture for dice to land beneath. We finally took this rule out of play. 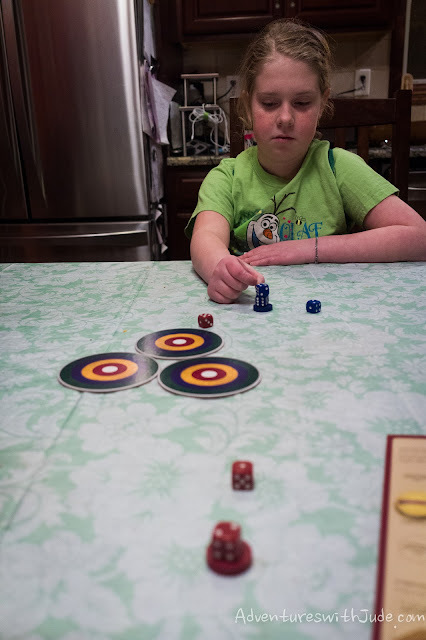 Trying to be extra gentle with flicks caused the opposite problem -- dice fell to the table, but in front of the targets, not on. Instead of "take out another player," it became "just don't lose your own turns." The included instruction sheet says the game should take about 15 to 20 minutes to play. This was true -- the game was over in about that time, but there were no winners. When you're playing with younger children, you might be able to convince them that everyone "tied," but the bigger kids weren't having any of it. Does this game provide practice in the skills that SimplyFun tries to support? Yes, it does. But is it fun? It wasn't for us.